At 39, his knees aching and his arm suspected of lacking its familiar zip, Bob Gibson made what he knew was his last Opening Day start for the Cardinals and delivered a performance in which he overpowered and fooled batters barely more than half his age. 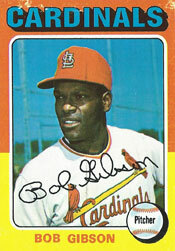 On April 7, 1975, Gibson made the last of 11 consecutive Opening Day starts for the Cardinals. He struck out 12 Expos in eight innings, but took the loss in Montreal’s 8-4 victory over the Cardinals at St. Louis. Before the season began, Gibson had said 1975 would be his last year as a player. The 1975 opener matched Gibson against an Expos club that started seven players ages 24 or younger: shortstop Tim Foli (24), catcher Barry Foote (23), left fielder Tony Scott (23), second baseman Pete Mackanin (23), center fielder Pepe Mangual (22), third baseman Larry Parrish (21) and Gary Carter, a catching prospect who got the start in right field the night before his 21st birthday. After seven innings, Gibson and the Cardinals led, 4-3. Gibson struck out at least one batter in each of those innings. He struck out the side in the second. In the eighth, Carter grounded out and Mackanin struck out, giving Gibson a dozen strikeouts in a game for the first time since he compiled 14 versus the Giants on Aug. 30, 1972. With two outs and none on, Parrish singled to center. Larry Biittner, pinch-hitting for pitcher Dave McNally, singled to left. Scott, a switch-hitter who would play for the Cardinals from 1977-81, was up next. He was 0-for-3 in his first game against Gibson. Batting left-handed, Scott fell behind in the count 0-and-2. Gibson was a strike away from escaping the jam and preserving the lead. His next pitch, though, was high and Scott slashed at it, driving the ball down the line and into the left-field corner for a two-run double, putting the Expos ahead, 5-4. Gibson was lifted for a pinch-hitter in the bottom of the eighth. In the ninth, Carter hit a three-run home run off Elias Sosa, making his Cardinals debut after being acquired from the Giants. Gibson’s line: 8 innings, 9 hits, 5 runs, 5 walks, 12 strikeouts. It was the 72nd and final time Gibson achieved double-digit strikeouts in a game.